Nov. 25, 2016 - A review of the sawn softwood (lumber) industry in Europe and Russia reveals generally mixed and unsettled global economic trends for 2015 and to date in 2016. However, Russia’s currency advantage is creating issues for exporters competing against Russia in key markets. Apparent sawn softwood consumption in Europe in 2015 remained close to the 2014 level of 89 million m3. Economic conditions are highly variable between countries, as reflected in the wide range of growth rates in softwood sawnwood consumption seen last year, i.e., both under-performing markets and others that showed healthy growth. Only five of the top 10 sawn softwood-consuming countries in Europe increased their consumption in 2015, and collectively the top 10 returned a negative result. The central European market also reported healthy growth, with Germany (+1.5 per cent), Austria (+4.2 per cent) and Poland (+4.2 per cent) all growing their consumption; for Austria in particular, this was after several years of decline. Belgium and Finland were the most disappointing sawn softwood markets in Europe in 2015. Both reported double-digit percentage consumption declines, and collectively their consumption dropped by 1.0 million m3. GDP growth in both countries is well below the EU average. In Finland, the rising popularity of wooden high-rise construction has been insufficient to compensate for the eroding single-family home market, for which 2015 starts represented the lowest level of this century. France and the U.K. (the two largest importers of sawn softwood in Europe) both reported decreases in consumption last year; this was the fourth consecutive year of decline in France, while consumption in the U.K. had been growing rapidly in recent years. In 2015, Germany was still the largest consumer of sawn softwood in Europe with 18.5 million m3 – nearly twice that of the U.K., Europe’s second-largest consumer. Although traditional markets are struggling, there are some new, fast-growing markets. Estonia is still a relatively small one (consuming 1.7 million m3 in 2015), but it has Europe’s highest per capita sawn softwood consumption, due largely to its strong export-oriented remanufacturing sector (which requires sizeable imports of sawn softwood). In terms of output, Europe produced 102.6 million m3 of sawn softwood in 2015, a small decrease (-0.7 per cent) from 2014); producers lacked an incentive to increase production given sluggish demand in Europe and key overseas markets. Nevertheless, there were notable production increases in Austria, Poland, Sweden and Turkey: collectively, these countries added 1.4 million m3 to total production. Reported increases for the four countries ranged at 3.9 per cent–5.0 per cent, due mainly to positive developments in domestic markets (although production growth in Sweden was driven by expanding exports). There were no clear production trends seen in Europe in 2015. Output grew in Sweden while decreasing by 2.6 per cent in neighbouring Finland. Production went down by 0.3 million m3 in Germany, but increased in Austria by a similar volume. Other significant production decreases occurred in France (-2.3 per cent), Slovakia (-17.6 per cent), Romania (-19.3 per cent) and the U.K. (-7.2 per cent). Production has been dropping for several years in France, but until 2015 (like production) it had increased in the U.K. for several years. Production capacity in Europe is still sufficient under the prevailing market conditions. No major changes were evident in 2015 and the first half of 2016 (although some increases in productivity and production capacity were achieved through minor closures in Central Europe, and as a result of existing mills’ continuing efforts to upgrade in order to remove bottlenecks). Prices for European sawn softwood varied by market in 2015. In Germany, they were relatively stable, with a nominal decrease of 1.4 per cent (in euros per m3); there was almost no price movement in the first half of 2016. U.S. dollar prices in major markets eroded from early 2014 to the middle/end of 2015. Overall market demand was relatively in balance with supply for the year, and prices moved higher in the second half and early 2016. Much of the price decline in the first half of 2015 was due to ongoing currency devaluations against the U.S. dollar, with exporters giving away their currency exchange gains by lowering their U.S. dollar prices. In the Middle East, CIF prices rose by 7.6 per cent in 2015 compared to 2014; this was due to higher prices in the first half of the year. Prices declined thereafter, however, flattening to a level similar to that seen in 2014. As in Germany, prices for European sawn softwood exports to the Middle East hardly changed in the first half of 2016 despite rising volumes. Prices in Japan for European sawn softwood decreased in the local currency in 2015, but recent price developments have been in favour of European exporters due to the weakening of the euro against the yen. Japanese FOB port prices dropped in euro terms after the first half of 2015, and the average price for last year was 2.1 per cent lower than in 2014. Nevertheless, the depreciation of the euro against the yen this year means that prices in euros were 13 per cent higher in mid-2016 than in June 2014 – and at their highest levels since 2012. Japanese domestic production continues to expand at the expense of exporters in a push for fibre self-sufficiency. European imports of sawn softwood grew in 2015, with half the growth imported from outside Europe; the import volume was 35.3 million m3, a rise of 3.3 per cent versus 2014. About 80 per cent of this volume was between European countries, but external imports grew by nine per cent (to 6.8 million m3). Russian sawn softwood exports to Europe benefited from the devaluation of the Russian ruble, with the EU-28 countries importing 3.3 million m3 from the Russian Federation in 2015 – the highest volume since 2010. Imports from Belarus were up by 29 per cent to 1.0 million m3. Europe’s sawn softwood imports from North America was cut in half in 2015 to 0.3 million m3, with U.S. sawmills finding the domestic market more attractive. On the other hand, imports from the “plantation pine countries” (Brazil, Chile and New Zealand) nearly tripled last year to 0.2 million m3 as a result of the rising use of pine clears in European remanufacturing, e.g., thermal and chemical wood modification. and collectively the top 10 returned a negative result. Growth in European sawn softwood exports levelled off last year (to 1 per cent, from 5 per cent in 2014) at 48.9 million m3. EU-28 exports to overseas markets declined by 1 per cent to 20.0 million m3, and the overall growth (albeit minimal) was achieved thanks to exports between European countries. 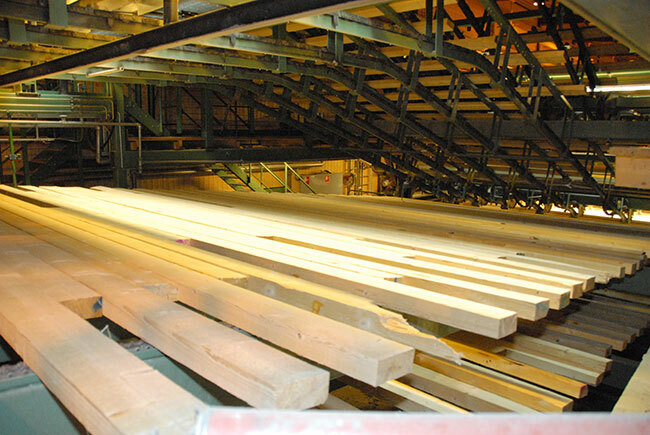 Demand for European sawn softwood declined by 5 per cent and 14 per cent, respectively, in the two main export markets of Japan and Egypt. In Japan, the decline was clearly related to a general drop in demand, while the overall market was stable in Egypt ahead of a weakening that began in Q2/2016. However, Russian exporters gained market share in the latter country due to a currency exchange advantage. Much of the decrease in Japan’s sawn softwood imports is attributable to the rise of domestic sawn softwood output using both domestically produced and imported logs. Japanese sawnwood imports from all countries shrank by 4 per cent last year to 6.2 million m3. North American exports to Japan remained the same as in 2014 at 2.34 million m3. The difficulties in sawn softwood exports to Japan and Egypt were offset by successes in other markets. For example, European exports to China continue to grow rapidly, rising by 20 per cent in 2015 to 2.1 million m3. The U.S. is also a growing market, with exports up 44 per cent last year to 0.4 million m3. The situation in overseas markets is generally problematic, and this is especially true for Nordic sawmills given the major differences in the supply/demand balances for spruce and pine, i.e., Nordic spruce is in strong demand in China and the U.S., while pine, conversely, is struggling due to declining exports (especially to Egypt). First-half 2016 export data indicate positive developments, with European exports to Japan and North Africa both higher. Specifically, exports to Egypt from both Finland and Sweden have grown, and that should ease pressure on sawn pine demand there. Exports to China by Finland and Sweden also grew in the first quarter of this year (by 66 per cent and 33 per cent, respectively), while North African markets became less stable in the second quarter. In Russia, most sawmills sought to export products as the devaluation of the Russian ruble enabled them to achieve good sales margins and high profitability, and this was despite the strong decline in global prices (in U.S. dollars) in the key sawn softwood export markets. Rising ruble-based prices for logs and other costs, in combination with low sales prices, constrained sales and output in Russia’s domestic market. Russia’s sawn softwood production increased slightly (+0.2 per cent) in 2015 to reach 32.1 million m3, but domestic consumption fell by nine per cent to 9.8 million m3. The drivers of production growth were in the Irkutsk (+4 per cent year-over-year) and Arkhangelsk (+8 per cent) regions; these two areas accounted for 26 per cent of total Russian production volume last year, while the Krasnoyarsk region (-2 per cent growth in 2015) accounted for 11 per cent. Most large export-oriented mills were able to maintain or increase their production volumes, but many small sawmills selling into the domestic market decreased their output. Chinese demand has been improving in 2016 and sawn softwood imports grew by 18 per cent in the first six months of 2016. During the same period, Russian sawn softwood exports were up by 36 per cent (although at lower U.S.-dollar prices). Since the Russian Federation had the largest currency devaluation of all exporting countries and offered very competitive prices, it gained market share in China at the expense of North American sawn softwood. Traditionally, exports of Russian sawn softwood have been mainly in the form of rough sawnwood: 21.5 million m3 (96 per cent of the total volume in 2015), of which rough-sawn pine accounts for 61 per cent (13.7 million m3). North African and Middle Eastern countries – particularly Algeria, Egypt, Saudi Arabia and the United Arab Emirates – continued to be major markets for sawn softwoods during 2015, although import volumes declined in response to political instability and falling oil revenues. For example, sawn softwood imports were down by nearly 25 per cent in Egypt (the largest importer in the region), due primarily to political unrest. The U.K.: +18 per cent to 373,000 m3. Japan: +1.8 per cent to 847,000 m3. There was a sharp drop in exports to Uzbekistan (-14 per cent to 2.4 million m3), as well as in Italy (-22 per cent) and France (-7.1 per cent). 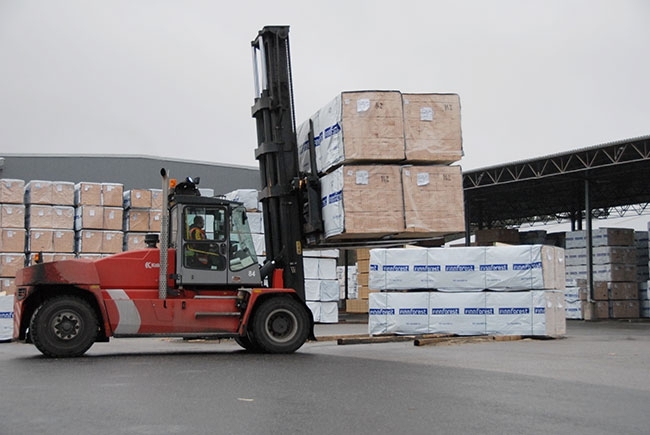 Russian exports of sawn softwood to Europe grew by 1 per cent in 2015 to reach 3.26 million m3. The largest increase was to Latvia – up 98 per cent to 202,000 m3. Estonia maintained its position as the largest European market for Russian sawn softwood, with imports growing by 4 per cent to 538,000 m3. China’s top import partners include Russia (number two in logs and number one in lumber), where expanding lumber exports are beginning to change the Chinese industry/market markedly. The border crossing shared by Zabaikalsk, Russia and Manzhouli, China is the largest land port for Russian exports. In 2015, log exports through Manzhouli totalled 5.4 million m3 (51 per cent of all Russian log exports), with lumber exports at 5.0 million m3 (53 per cent of Russian lumber imports). Total softwood log exports from Russia to China dropped by more than a million m3 (-10 per cent) from 2014 to 2015, dropping to 9.0 million m3 (although they have risen by 1 per cent in the first three months of 2016). By contrast, total softwood lumber exports from Russia to China increased by 1.2 million m3 (+16.5 per cent) from 2014 to 2015 to 8.4 million m3 (and are up by a huge 28 per cent through the first three months of 2016). With a lumber yield from logs processed in China at about 65 per cent, total softwood Russian log exports on a “roundwood equivalent” (RWE) basis appeared to have risen only slightly during the same time frame, moving from 21.1 million m3 RWE in 2014 to 21.9 million m3 RWE in 2015. Adding to the complexity is the estimate that about 20 per cent of all lumber imports into the land port of Manzhouli are “squared logs” or cants – technically classified as lumber and thereby bypassing the Russian log export tax (15 per cent and higher). Consequently, with more squared logs being exported from Russia, lumber exports are being overstated, meaning that the net change in exports from 2014 to 2015 appears to be almost nil. The continuation of positive economic drivers and the potential for a tightening of the supply/demand balance suggest an optimistic outlook for growth in sawn softwood markets until the end of 2016. For European producers, the key will be the health of the domestic market. For Russian producers, it will be preserving its competitive advantage in export markets and not giving up too much of its currency advantage.